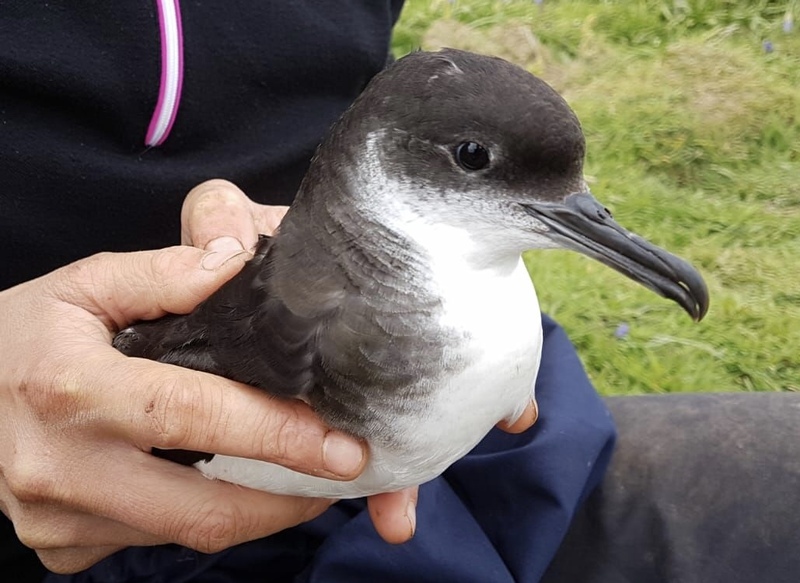 Could Manx Shearwaters be the ‘National Bird of Wales’? Our neighbours on Ramsey Island have already put forward this suggestion and I am inclined to agree. Staggeringly around 50% of the world’s population of Manx Shearwaters breed on the islands of Skomer and Skokholm and if you add in the numbers from Ramsey and Bardsey Islands the figure is close to 60%. 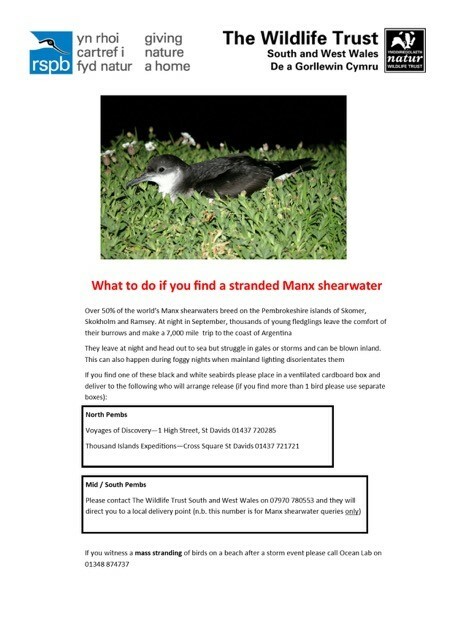 Manx Shearwaters are an elusive bird only coming to land under cover of darkness to feed their chicks in underground burrows. They have evolved to live out at sea and are beautiful flyers and swimmers. However, on land they struggle to even walk and are at risk from predation by birds like Great Black-backed Gulls. Darkness is their friend, allowing them to sneak into their burrows unseen. 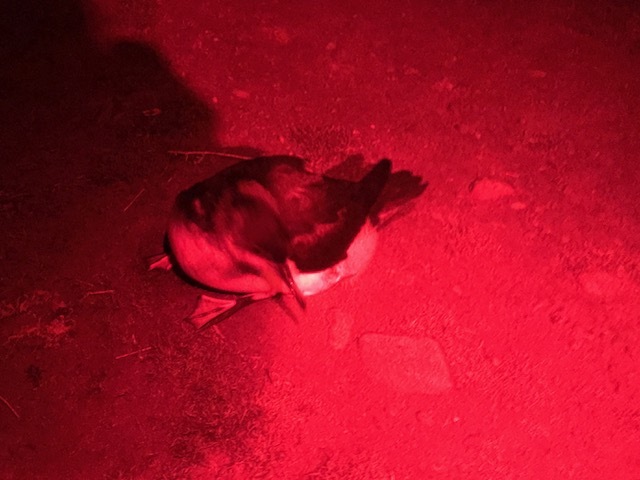 It is a real treat for overnight visitors to Skomer to experience thousands of shearwaters coming and going once darkness falls. They are unable to breed successfully on the UK mainland due to the predation of their eggs and chicks by rats. Therefore it is our absolute conservation priority to maintain Skomer as a rat free island. 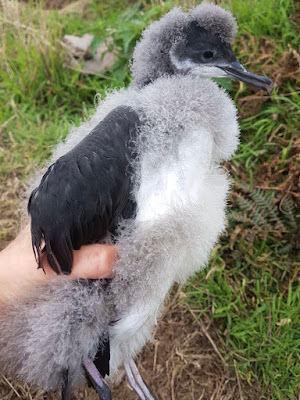 The start of September is when we hold a ‘shearwater special’ event on Skomer and this year it was more popular than ever. 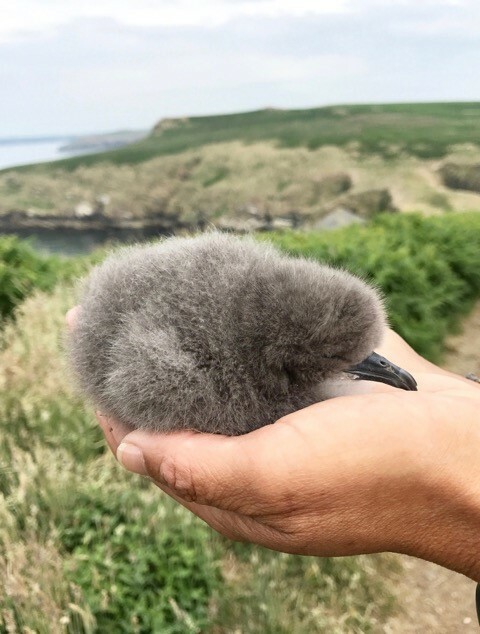 It is a two night event that includes a night time guided walk through the shearwater colony, a talk by researchers about their conservation work on the island and the ‘one off’ experience of helping researchers to weigh Manx Shearwater chicks in Skomer’s study colony. As well as that it is a chance to visit the island during a relatively quiet time of year, experiencing the peace and tranquillity of ‘island living’. A whole island census in June, last undertaken in 2011. Results from this are still to be determined so we will keep you updated on this as soon as we know! The development of an artificial nest box colony at North Haven enabling close monitoring of the 'manxies'. 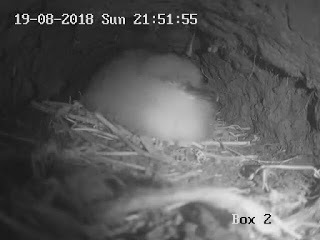 We had our own ‘Springwatch style’ camera installed in a manx shearwater burrow. 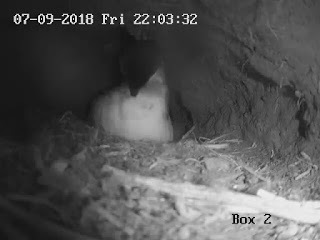 Watching the underground goings on in the burrow was fascinating. Mating, egg laying, hatching chick and over two months later the successful fledging of ‘burrow cam’ chick we imaginatively named Maxine…We hope to do the same next year and live footage will be streamed from Lockley Lodge. Be warned it is very addictive! This year the WTSWW joined with the RSPB to promote a campaign advising on what to do with stranded Manx Shearwaters. Strong winds at fledging time can make it difficult for the youngsters to make it out to sea and once they get blown inland can easily get disorientated by mainland lights leaving them stranded. Over 100 birds have been rescued and returned to sea, thanks to local volunteers and Thousand Island Expeditions boat operators. If you would like to see Manx Shearwaters then be sure to book in for an overnight stay on the island on next year's "shearwater special event". Bookings open on 1st October 2018 for WTSWW members and are fully open two weeks later. Please contact the booking office on 01656 724100 for more information. 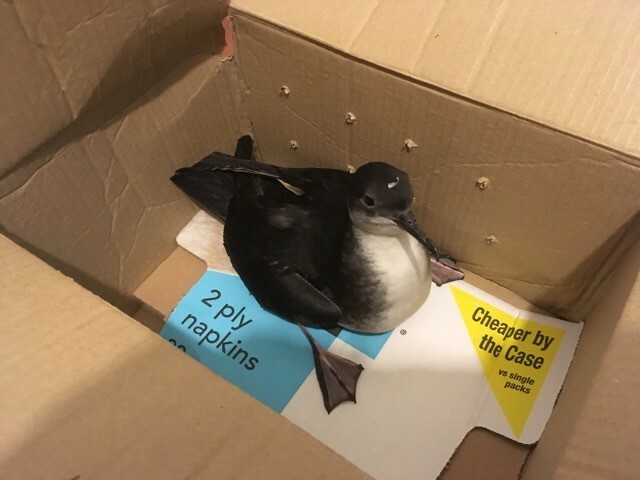 Once you have seen this beautiful enigmatic seabird I’m sure you will agree that Manx Shearwaters should indeed be deemed the national bird of Wales.